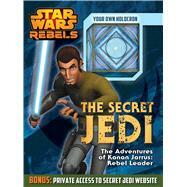 This breakthrough new book is filled with amazing insights and high-action adventures of the Jedi knight Kanan Jarrus. Plus the foldable holocron provides a gateway to carefully guarded exclusive digital content. The holocron is an organic crystal-lattice device which stores phenomenal quantities of data and guarded secrets! Discover the history and secrets of Kanan Jarrus, the newest Jedi to emerge in the Star Wars universe! Who was his master? How strong is the Force within him? What are his fighting skills and what type of light-saber does he wield? This exciting storybook with exclusive links to rare online content, will reveal intriguing answers to many of these questions. Based on action and events from the first 10 episodes of Star Wars Rebels, this book features five tales from the perspective of Kanan Jarrus, the secret Jedi. Packed with action, adventure, great reading, humor, and bold visuals, The Secret Jedi provides a wonderful glimpse into the new world of Star Wars Rebels, and the Jedi leading the rebel team. But what makes this a truly unique package is … the holocron! Packaged with each book will be a “holocron” toy that when arranged properly, reveals a secret code to a gated website that includes a wide range of bonus content linked to the book and the broader Jedi world.